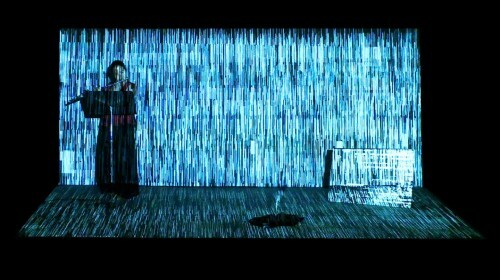 Trombe – a beautiful, haunting audio/visual performance work. It will repeat four times on the hour beginning at 7pm. On the stage at El Museo. Trombe evolves around the relationship between an object from the real world and a solo instrument, using live audiovisual processing and simple robotics. The interactions between the object and the instrument are constructed to have the multiple significations of the object transfer onto the music. Integrating the performer inside the projection gives special attention to the spatial qualities of the video. “Trombe” in French means a very active storm carrying a large amount of water. Jesse Tatum will be the solo flutist for the performance. Jesse is the Principal Flute for the Santa Fe Symphony and a member of the Chamber Ensemble Chatter.